Despite wasting half of it getting rid of those sharp bits, a whole pineapple is a lot of fruit! More than we can eat raw, especially since I am slightly allergic. After using some of it for a pineapple sorbet (coming soon! ), I had to think of other ways to get rid of the excess pineapple. So it got sprinkled with cinnamon sugar and thrown into a hot oven (minus the throwing). I love roasting things. I love how it can change something simple into something fancy. How it brings the sweetness out of fruits and vegetables. I love the brown crispy bits that form when you roast something. Roasted pineapple is good. I knew I wanted to put the roasted pineapple into a pound cake, but because I can’t leave well enough alone, I streuseled it up. 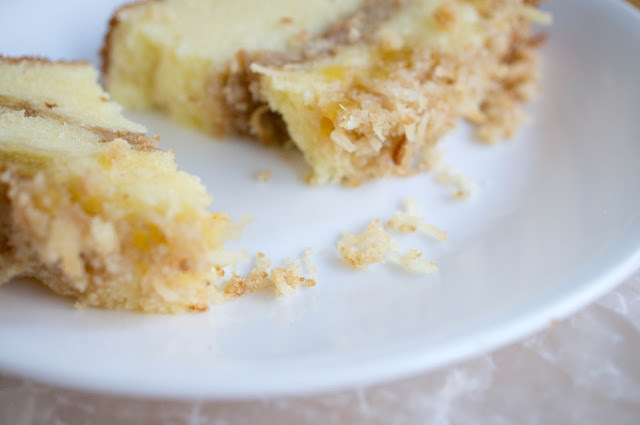 Streusel, or kruszonka in Polish, is clearly the best part of any cake. I still remember eating the chunks of streusel off my mom’s or grandma’s cakes when I was younger. I would try and pick off chunks in such a way that they wouldn’t notice; I’m sure they noticed. When I was a bit older, I used to make and bake a single layer of streusel for myself. But of course, it’s never as good as when you have to sneak it off a cake. 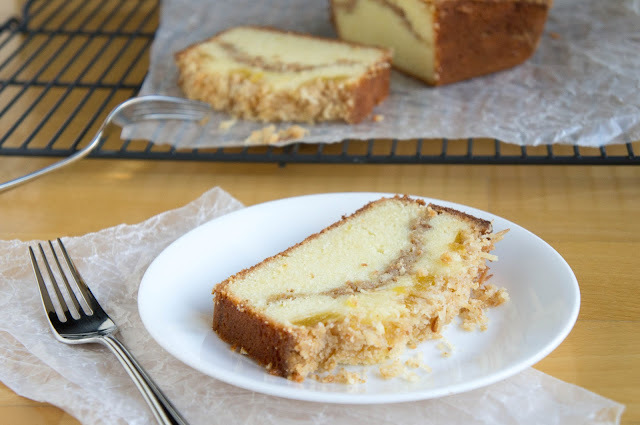 This streusel is loaded with toasted coconut and layered in the center of the pound cake. 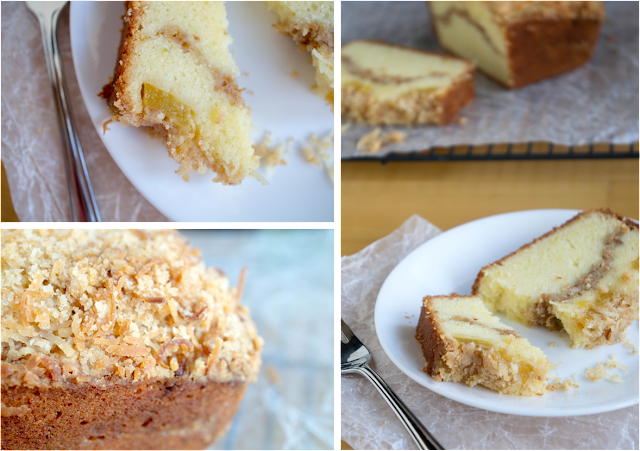 The same streusel except with untoasted coconut is sprinkled generously on top of the pound cake. We use untoasted on top because it will toast while baking. We use toasted inside because it is hidden during baking. It’s science. And because we have pineapple and coconut, I completed the tropical trio by adding some lime zest and juice to the pound cake. This pound cake is thick and moist and not too sweet. 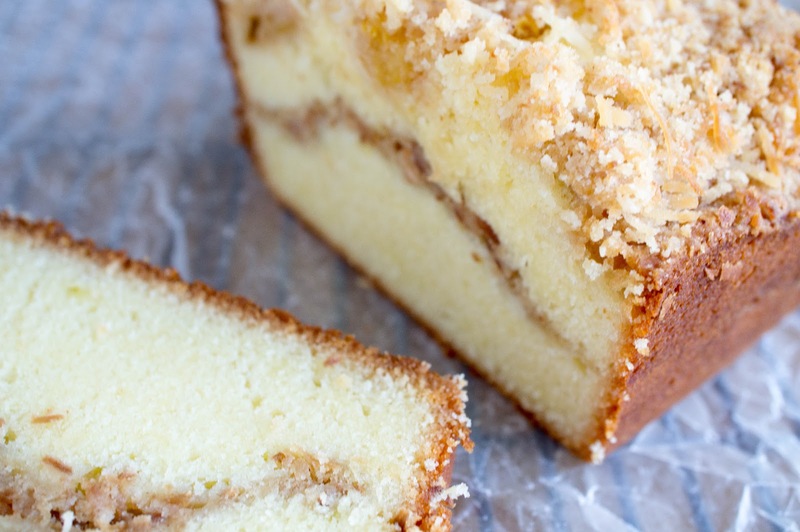 The streusel adds an extra hit of sweetness and some texture. 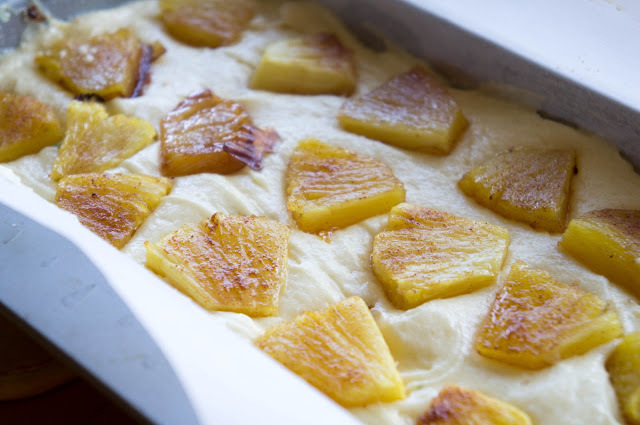 The roasted pineapple chunks are tart juicy pockets in the cake matrix. Go ahead and eat all the streusel off the top, I won’t tell. * If you don't have fresh pineapple, you can use canned, just try and get some that isn't packed in heavy syrup and try and drain well before roasting. Preheat oven to 450F. In a small bowl, combine sugar and cinnamon. 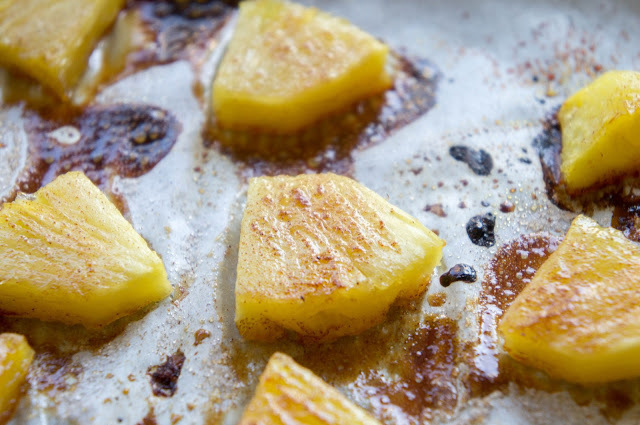 On a rimmed baking sheet lined with parchment paper, arrange pineapple pieces in a single layer. Sprinkle with lime juice and cinnamon sugar. Bake in the top of the preheated oven for about 15 minutes or until golden brown. Combine flour, brown sugar, cinnamon, and salt in a bowl. Cut cold butter into small pieces and using your fingers or a pastry cutter, combine with the flour mixture until it resembles coarse crumbs. Do not let the butter melt. Split this mixture in half. To one half, add the toasted coconut. To the other half, add the untoasted coconut. Keep cold until ready to use. Preheat oven to 325F. Grease a 9 inch loaf pan and line with parchment paper so that it hangs over two sides for easy loaf removal. Grease the paper too. Combine sugar with lime zest and rub between your fingers until the sugar is infused with the lime scent. In a stand mixer fitted with a paddle attachment or with a hand mixer, cream the butter and lime sugar until fluffy and pale in colour (about 5 minutes). Add in eggs and yolk one at a time, beating well after each addition and scraping down the sides of the bowl as necessary. Add vanilla and lime juice and beat until incorporated (the mixture may look slightly separated because of the acid in the lime juice. Don’t worry, it’s fine). In a large bowl, whisk together flour and salt. Add to the wet ingredients and stir just until combined. Spread half the batter into the bottom of the loaf pan. Top with toasted coconut streusel. Layer in the remaining half of the batter. Top batter with pieces of roasted coconut, making sure not to overload it, we don’t want it to be too soggy. 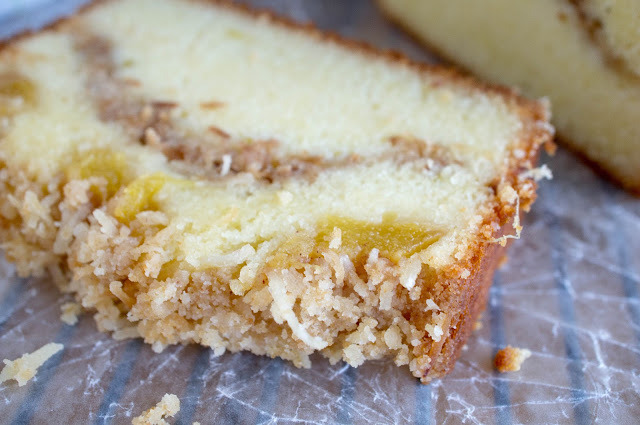 Layer on untoasted coconut streusel. Bake loaf in the center of the preheated oven for 1 – 1 hour and 20 minutes or until a cake tester comes out clean. If the streusel gets too brown, cover with some aluminum foil for the remainder of the baking time. Remove from the oven and let cool in the pan for about 10 minutes. Lift loaf out of pan using the handy parchment paper overhangs that you made at the beginning and cool completely on a rack before slicing.